Aspirus Keweenaw Auxiliary was founded in 1948. Its sole purpose is to raise funds for the hospital. The Auxiliary owns and operates The Gift Nook. It is located in the hospital lobby and hosts several fundraising events each year. All profits raised by the Auxiliary are given to Aspirus Keweenaw to purchase medical equipment. The Auxiliary meets monthly from September through May on the third Thursday of the month. 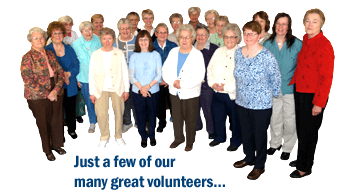 Many types of volunteers donate their time to Aspirus Keweenaw. Retired seniors, university students, interns and residents are just a few of the groups who volunteer. Nursing, lab, pharmacy and physical therapy students are encouraged to contact Aspirus Keweenaw about internships. High schools students interested in learning more about health related careers also have the opportunity to volunteer. Students must be over 14 years of age and must commit to volunteering at least 30 hours over the course of one school year. They also must go through the screening process and testing. Volunteers are required to go through a screening process that includes filling out an application, passing a drug and alcohol screening, taking a TB test, passing a criminal background check and going through an orientation process. Our junior volunteer program offers excellent opportunities to learn about health-related careers and is an excellent experience for young adults. We also offer a number of ways junior volunteers (ages 14 to 18) can volunteer during the summer months. The junior volunteers and assist the staff in nursing, fitness, public relations, nutrition services, community relations, radiology, physical therapy, and the clinics. 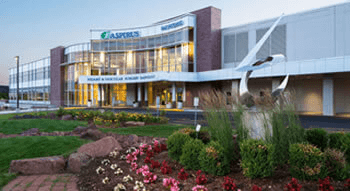 For more information about volunteering at Aspirus Keweenaw Hospital, please call Jenn Jenich-Laplander at 906-337-6541. Completed applications can be returned to Jenn Jenich-Laplander at Aspirus Keweenaw Hospital or emailed to Jennifer.Jenich-Laplander@aspirus.org.